Period is the horizontal rows of elements in the Periodic Table. The modern periodic table has 7 periods. The period number indicates the number of electron shell. Elements in the same period have same number of electron shells. The proton number of elements increases from left to right crossing the period. The number of electrons is also increases from left to right crossing the period. The sixth period has 32 elements. 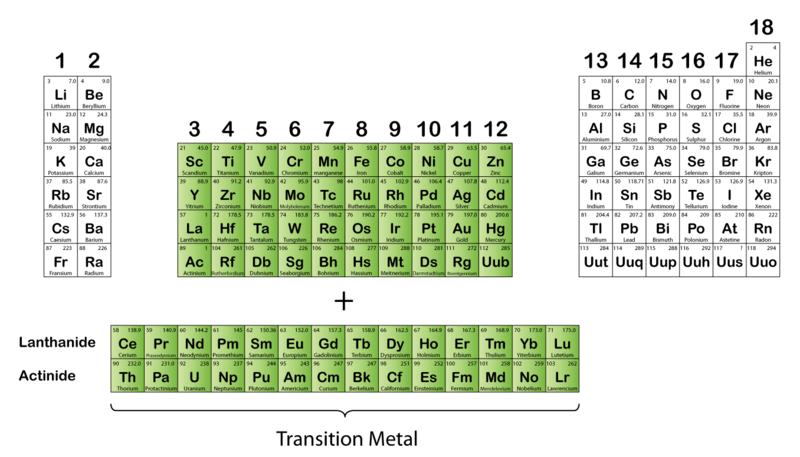 Due to short of space, 14 elements in the transition metal group are removed from the same horizontal row and is placed below the main table, These elements are called the Lanthanide Series. The seven period also has 32 elements. With the same reason, 14 elements are removed from the same horizontal row and is placed below the main table, These elements are called the Actinide Series. the state of matter changes across the period. The size of the molecule changes across the period, too. The diagram above shows that the state of matter of the elements in period 2 and period 3 change from solid to gas across the period (At room temperature). In period 2, the first 4 elements are solid whereas the last 4 elements are gases. The melting point of lithium is low while the melting point of boron and carbon is very high. In period 3, the first 6 elements are solid whereas the last 2 elements are gases. As shown in the diagram above, the atomic size of elements in period 2 and period 3 decreases across a period. The number of proton in the nucleus increases whereas the number of shells remains unchanged across a period. As the number of proton in the nucleus increases, the positive charge of the nucleus will also increases. The negative charge of the valence electrons will also increases due to the increase of number of valence electrons across a period. Thus, the attraction force between the nucleus and the valence electrons is getting stronger and stronger across a period. This force will pull the valence electrons closer to the nucleus and thus reduces the atomic radius. Therefore the size of atom decreases across a period from left to right. The size of atom increases down the group. The size of atom decreases across a period from left to right. For transition metal, the size of atom does not have obvious change across a period. There is gradual chemical change across a period. The acidity (or basicity) of the oxide of element changes across a period. The metallic properties, the electronegativity of element also change across a period. From left to right across a period the oxides change from alkaline/basic (with metals e.g. Na2O) to acidic (with non-metals e.g. SO2). As we go across a period from left to right, the elements change from metals to non-metals. There are about 7 elements in the periodic table are classified as semi-metals. On the right hand side of the periodic table, there are 7 semi-metals form a staircase like pattern, act as a divider between metal and non-metal. The semi-metals are also called the metalloid. The most widely used semi-metals are silicon and germanium. It is used to make diodes and transistors in electronic industry. Electronegativity is a measure of the potential of atoms to attract electrons to form negative ions. as the proton number increases, the positive charge of the nucleus will increase accordingly. this will increase the ability of the atom to attract electrons from the surrounding and thus increase the electronegativity of the atom. Transition metal is a block of metallic elements in between Groups 2 and 13 in the Periodic Table. They are much less reactive than the alkali metals. They do not react as quickly with water or oxygen as alkali metal. The bond between atoms of metal is called metallic bond and usually it is a very strong bond. 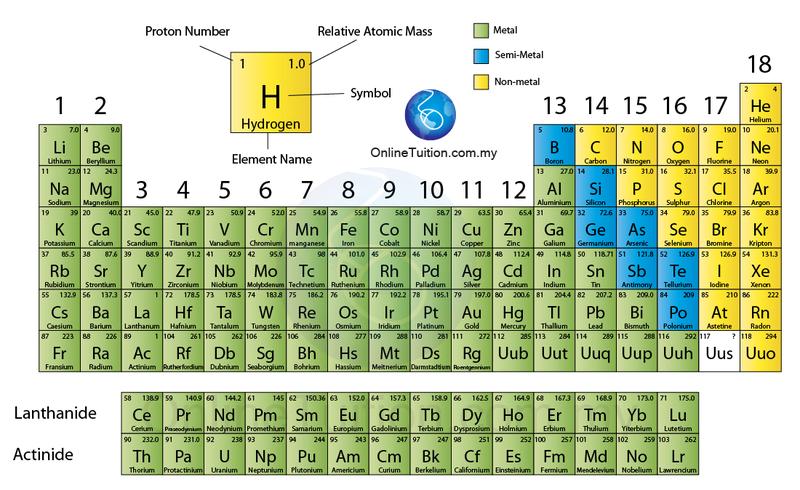 Thus all the transition metals have high melting points and boiling points. For example: iron melts at 1535°C and boils at 2750°C. Mercury is a transition metal, but with unusual low melting point ( − 39°C). Transition elements tend toform coloured compounds either in solid form or dissolved in a solvent. Table below shows the colours of some aqueous solutions of ions of transition elements. Transition elements or their compounds have catalytic properties. A catalyst is a substance that speeds up a reaction but it itself does not change chemically after a reaction. Many transition metals are used directly as catalysts in industrial chemical processes. transition metal can have a variable oxidation state, which means it can form more than one ion. For example, iron(II), Fe2+ and iron(III) Fe3+; copper(I), Cu+ and copper (II) Cu2+. Transition elements can form complex ions. A complex ion is a polyatomic ions (positive or negative) consisting of a central metal ion with other groups bonded to it.